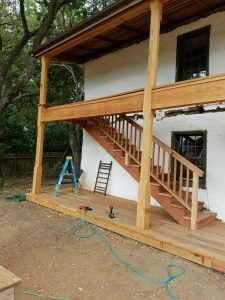 Contractor Brian Bogaard has completed construction on the railing and exterior stairs of the Castro Adobe. This is an exciting step forward to improve safe access to this historic structure. 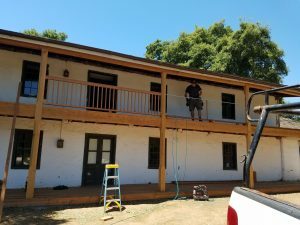 Check out the photos of the progress. The balcony decking under construction. Stairs and railing haven’t been constructed at this point. View facing north. The exterior stairs under construction. 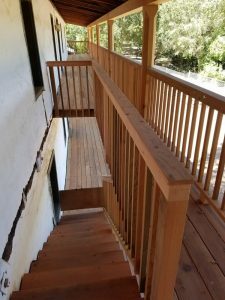 A wood partition will eventually enclose the exterior stairs at the bottom. 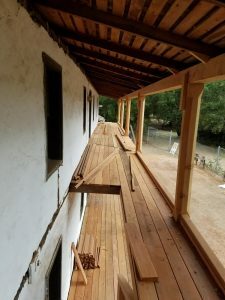 Contractor Brian Bogaard works on the construction of the railing on the façade of the Castro Adobe. The balcony decking, railing and stairs complete. This is the view facing north.